Who was the first sitting U.S. President to visit Japan? Even more interesting are Bing's pictures and his reactions to a very different culture. Give the blog a look and, if you can, drop a buck or two in the plate. You can question the wisdom of parents paying to get back a child teetering on teenagehood at a later date. Thanks, John. As for bringing back a kid at his age, we are trying to turn him into a Militant Atheist while there is still time. Well, thank God ... er ... goodness you have a plan. 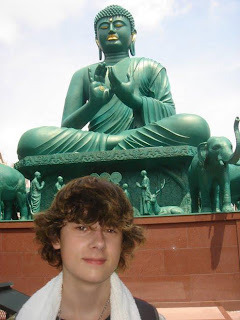 I sent my youngest son to Europe several years ago. And, yes, I paid to bring him back (although he probably would have found a way to adjust to staying in Switzerland if he'd been forced to do so). Fortunately, it didn't work out too badly. He didn't bring home and bad habits that he hadn't taken there with him.